If you haven’t heard, red is the new black this season. If you inject your office wardrobe with one new color for the season this should definitely be it. I love the shift shape, subtle ruffle and flare sleeves on this one. Definitely a desk to date kind of style. When it gets colder, I’d throw on a cardigan and suede over the knee boots. Majorly channeling Joan Holloway via Mad Men in this form-fitting shift dress. I was hesitant about a body conscious dress for the office but the stretch on this one makes it crazy comfortable and it ended up feeling more flattering than even some of my looser dresses. I layered it with a classic oxford shirt for now and paired it with a trench and loafers for later. If you followed along to Fashion Week than you already saw this dress in action – but I love it for the office too. 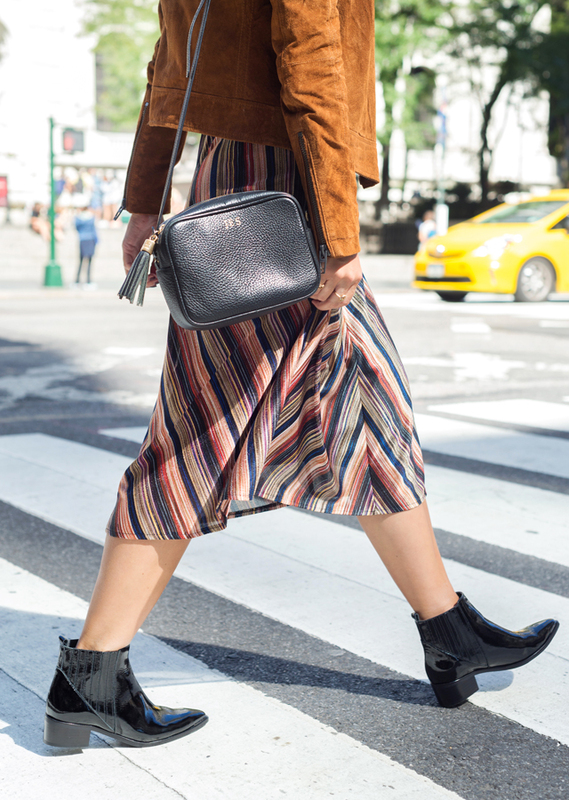 The multi-colored stripes allow this to match with virtually anything – from jewel toned pumps and bag to sleek booties and a neutral suede jacket. And the tie neck and fit and flare shape have a cool 70s working girl vibe. WOW! Hard to pick a favorite but I will go with the red dress accessorized with the cute black cardi and fabulous boots. All outfits and photos are incredible!